Church bells ring every 30 minutes in Saint-Cyprien, reminding one of how quickly time passes. Yet in this medieval village, on a hillside above the Dordogne River, no one seems to notice. Most shops close for at least two hours at lunchtime. To find the largest selection of morning bread, it is best to arrive at one of the two local boulangeries before 10 a.m. But, other than that, there is little need for clocks, or even a calendar. While exploring the Périgord region of southwestern France last September, my husband, Ken, and I happened upon Saint-Cyprien, parked our rental car alongside the 12th-century church that stands at its highest point and ate lunch across the street on the terrace of the Au Petit Montmartre restaurant. Over a plate of cassoulet – a hearty stew traditionally prepared with beans, duck and sausage – we looked out at the rooftops of Saint-Cyprien and the valley below it and decided that we had stumbled upon the perfect place to experience life in rural France. On previous trips, that might have merited a “note to file” for a future journey, but on this occasion it was a call to action. For the second consecutive year, we had rented our Brooklyn, N.Y. townhouse for the fall and were using the proceeds to live for three months in France while I continued working as a writer. (Ken is retired.) 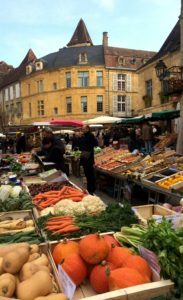 Our goal was to experience French life through the eyes of the locals, shopping in open-air markets, cooking with seasonal ingredients and communicating with people in their own language. Saint-Cyprien looked like a place where we could do that. With most of the autumn ahead of us and very little in the way of a preset itinerary, we resolved to arrange a home rental there. Having already made other reservations, we couldn’t take occupancy for two more weeks. We had begun our visit to the Périgord Noir, or Black Périgord, in Sarlat, another medieval village, with a labyrinth of sandstone buildings. Guidebooks recommended it as a base for visiting this region, an area dotted with prehistoric caves, elaborate gardens, castles and limestone cliffs that overhang the Dordogne River and its tributary, the Vézère. 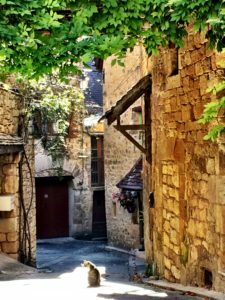 Though well situated, Sarlat had been given over to tourism, with a profusion of shops selling tacky souvenirs and local food products (nut cake and cans of foie gras, for instance). Even the Saturday market, scenically set along a cobblestone street and surrounded by historic monuments, seemed mostly frequented by tourists, with prices to match. 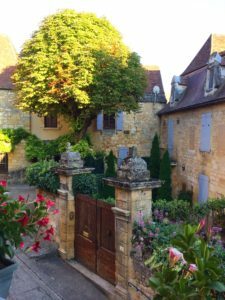 In fact, the only whiff of local color we observed in Sarlat was during les journées du patrimoine, or heritage days, the third weekend in September. All over France, certain landmark buildings, normally closed, are open to the public. Sarlat observes the occasion by lighting the streets on Saturday evening with votive candles. And during this celebration, under the stars, we attended a superb chamber music concert, in the abbey of the cathedral where there were few tourists in the spirited audience. After that, the crowds in the region thinned, and it became a buyer’s market for lodging. Many homeowners in this popular vacation destination rent properties when they aren’t using them. As we scoured the sharing economy website Airbnb for other places to live, we noticed that posted rates dropped by 30 percent to 50 percent. For a stay of one week or longer, we were able to negotiate an even better deal. One week before our arrival, we booked nine nights in a two-bedroom, two-bath house in the old part of Saint-Cyprien ($96 per night). View from balcony on rue de Terme. The 14th-century cottage on rue du Terme was up a small but steep incline (terme means small hill) from a remaining portion of the old ramparts. It retained vestiges of past centuries’ remodeling jobs: Victorian-style French doors, windows and balconies; high ceilings; and two ample-size bedrooms, the larger of which was about 16 feet by 8 feet. The current owners are Sabine and Christophe Grossemy, who run the local real estate management company En Toutes Saisons (their company name means “in all seasons”) and had renovated the house with renters like us in mind. They had installed a new kitchen, putting the stove in the old hearth, and added an upstairs bathroom, which avoided some of the ups and downs on the narrow, winding interior staircase. Best of all, because of its position on the hill and southern and eastern exposures, our house was flooded with sunlight for much of the day. The village itself had few sightseeing attractions, and for us that was the big draw. After gawking at Château des Milandes — the lavish home once occupied by the African-American jazz singer Josephine Baker; poking around the caves of Font-de-Gaume and Lascaux; or cruising the Dordogne on a flat-bottomed boat called a gabarre, I would pour myself a glass of wine and sit on the terrace off our bedroom. It overlooked an 18th-century mansion on the other side of the street, originally built for François Chaudourne sieur du Plassial, chief officer of the French Royal Navy. Now owned by an elderly man who is in a retirement home, it stood sadly vacant. Though the graying of rural France was much in evidence, the Périgord villages, many built on promontories, were clearly a tough place to grow old. In Saint-Cyprien, for example, there were handrails on some of the steepest inclines. We observed elderly people lumbering up them, holding the railing with one hand, using a cane with the other, and somehow managing to keep a loaf of bread tucked under one arm. On the same paths, in the late afternoon, one could hear the squeals of schoolchildren as they kicked a soccer ball uphill and tried to intercept it on the descent. In the evening, cooking aromas wafted up from every direction. The medieval village of Saint-Cyprien has a 21st-century infrastructure. From our own kitchen, with two large windows that opened onto rue du Terme, we could observe how a medieval village gets wired, with pipes and conduits drilled through the exteriors of centuries-old buildings to bring in modern plumbing and electricity. High-speed internet access throughout the house enabled me to communicate with friends, colleagues and family in real time. When I craved more physical activity, the twisting old streets and remnants of centuries past were a continuing source of fascination. Around the corner, and up a cobblestone path in the opposite direction from our house, were a series of alleys that used to be the dressmaking district – the only clue of this prior use being the street name, “rue de la Couture,” on one of them. And then there was the Place des Oies (geese), once the site of the poultry market, where a hand-cranked water pump still stands. A stone fountain near the church, where in times past villagers could come to fill their water jugs, had been converted into a small garden. A former tobacco warehouse stood abandoned, while a 13th-century cloister was being turned into apartments. My favorite day in the village was Sunday. Down the hill from our house, rue Gambetta, the main thoroughfare in the lower village, was closed to traffic so merchants could set up for the weekly open-air market. There was much air-kissing, as the line formed to buy rotisserie chickens, and a strawberry vendor struggled to explain the difference between three cultivated varieties. For locals, this was a place to see and be seen. Next stop: a cheese mobile that makes the rounds on market days in nearby villages. The woman behind the counter, with a stud earring above her upper lip, seemed to recognize me from the Tuesday market in Le Bugue. I was the foreigner who spoke rudimentary French, but did not confine herself to such familiar varieties as St. Nectaire. Instead, I let locals cut ahead of me in line and watched what they ordered. This time I took my cues from the couple who opted for the runny brie laced with truffles. They seemed to be assembling a platter for company and wanted an assortment of cheeses made with cow’s, sheep’s and goat’s milk. I exercised greater restraint, reminding myself not to buy more than I could eat in the next several days. That’s the French way. After one more purchase – several slices of jambon blanc from the charcuterie truck – my market haul was complete. It all fit neatly in the wicker basket that we found hanging on a coat hook in the vestibule of our house. Carrying it over one arm, I passed shoppers lingering for coffee outside the Lucco boulangerie. The peal of the church bells signaled that it was noon, which meant that the market and stores would soon close. On Sunday afternoon in France, they do not reopen. Before the workweek resumes, this is a time for calm, not commerce, and a reminder to relax. Deborah L. Jacobs, a former senior editor at Forbes, is the author of Four Seasons in a Day: Travel, Transitions and Letting Go of the Place We Call Home and Estate Planning Smarts: A Practical, User-Friendly, Action-Oriented Guide. Follow her on Twitter at @djworking and join her on Facebook here. You can subscribe to future blog posts by using the sign-up box on her website’s homepage. thank you so much fo your lovely (and so realistic!) 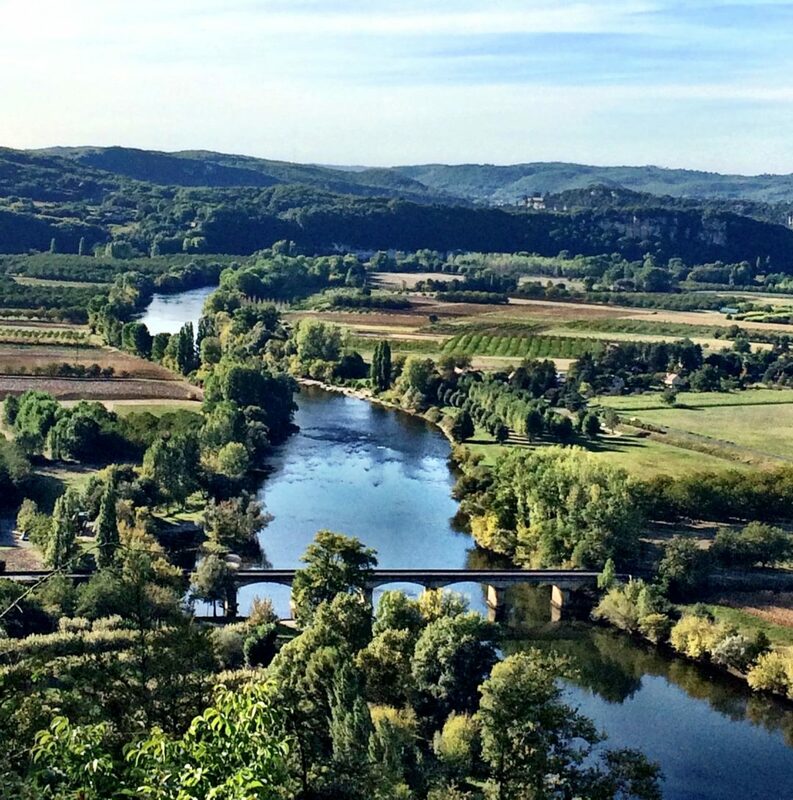 article in regards of the Dordogne and St Cyprien ! as we said in french : “the door of Le Terme will always remains opened for you”! with warmest regards from St Cyprien, Périgord, France. Merci, Sabine ! We will be traveling in other parts of France this year, and look forward to seeing you on a future visit to the Dordogne.